Now that is a question. When I started researching appropriate footwear for Hadrian’s Wall, the concensus seemed to be that you need waterproof boots. Which is fine for some, lots of people like wearing boots for all sorts of walks. It’s just … I really don’t. I prefer shoes, I like the lightness of them, I like the flexibility of them. And I specifically like my shoes! They have rubber soles, so have a good grip and good traction. They are non-Goretex, so there is less of the hot and sweaty and more of the airy and cool, and they also dry quicker – and let’s face it, every shoe or boot will get wet in prolonged rain or a dip in a stream or bog. And best of all, they fit my feet and have enough cushioning to stop or at least postpone the Plantar Fasciitis flare-ups on tarmac or hard surfaces. Sooo … do I really need to bring my Goretex boots? Really? I did a lot of googling and found one site that offered guided walks, and they actually said you needed good, broken in footwear suitable for the season, either boots or shoes. So maybe there was hope? I did a lot of YouTubing focusing on people’s footwear and the state of the path (I’ll save the view for when I get there). There is an awful lot of tarmac on both ends of the trail and the terrain doesn’t look too scary. Besides, I have walked the descent from Cruz de Ferro to Molinaseca, and the ascent to O Cebreiro in shoes, so I’m not worried about that. 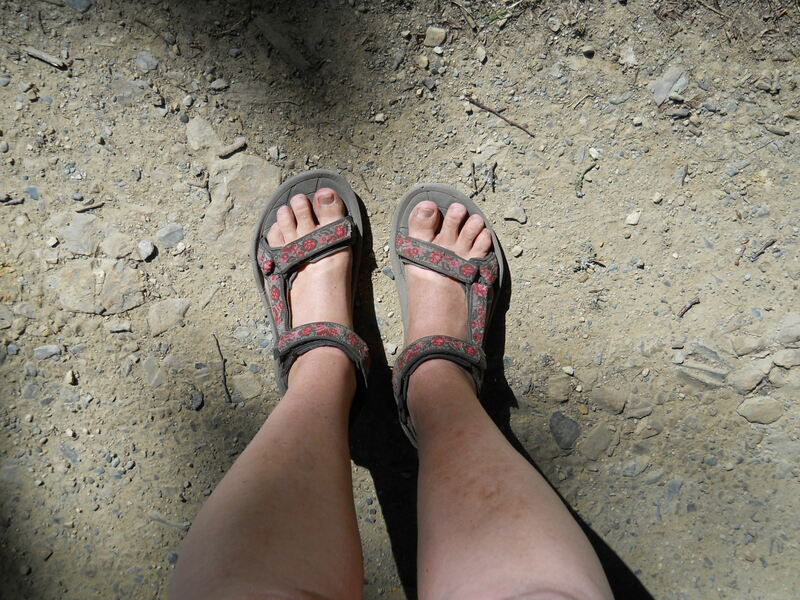 Then I got in touch with a member of the Camino forum who had walked it and asked what footwear he would recommend. He also suggested boots, but as lightweight as possible. He said there were places ‘in the middle’ where boots were clearly the best choice, but he also commented on the amount of tarmac where you clearly don’t need boots. Interesting. I started wondering if it would be possible to walk it with walking shoes for main and hiking sandals for spares, like I do in Spain. That way if it got wet (from above or below) I could just change to the sandals and get wet. Skin and sandals dry a lot quicker than a pair of Goretex boots! Then it’s easy enough to just change back to dry socks and shoes after. Also, it might not rain at all, and then I would have sandals for resting and my good shoes for the tarmac. It sounded very doable, very lightweight – and very much like positive thinking! So I got in touch with another blogger, Rose at RucksackRose, and asked her what she thought about this unconventional approach. She always seems to have very sensible advice and admitted in her blog that she had got the boots wrong when she walked it. Rose very kindly got back to me and told me that in her opinion, in the summer and with decent weather, that shouldn’t be a problem. She could not recall any major bogs on the trail, though there might be a bit of mud here and there. And who’s afraid of a little mud? No sooner had she sent me her answer than I watched a bit of a video again, and there is a woman in hiking sandals walking along one of the larger forts, so in the ‘middle’ bit! If she can do it, so can I. That settles it, I am taking my lovely shoes and tried and tested sandals (below) and crossing my fingers for good weather (or at least short showers)! Hope it works out Linda…I’ve never worn boots myself, I’ve always found them heavy and cumbersome. Lightweight is the way to go. Thanks, David – it did indeed work out very well! We both got our shoes wet one day due to dew 😀 but other than that we were glad to have lightweight and flexible footwear with decent grip and airy mesh, we could feel the wind blowing in!